"Tim has changed my life! I can honestly say in a few days I progressed more than I could have dreamed under Tim’s diligent and expert help. I had no idea what to expect never having been on a painting holiday, I was subsequently astonished and delighted by the most comprehensive and enjoyable time. I have learned a huge amount from Tim who is truly an excellent teacher. I have been on holidays to Naxos and Cornwall and would recommend them heartily, I go regularly! Tim and Henrietta are an exceptionally gifted couple and a delight to work with. John Napier- theatre set designer and recipient of many Tony and Olivier awards, notably Les Miserables, Cats, Starlight Express and many more. Tim has changed my life! I can honestly say in a few days I progressed more than I could have dreamed under Tim’s diligent and expert help. I shall be booking in again. Best Wishes to Tim and Hen. Anneka Rice. Entertainer. ‘ a glorious 3 days. I shall go back more confident and I would love to come back.’ Jilly Edwards, Devon. ‘Just what I needed, my confidence levels were waning and Tim revitalized them no end. You are a great teacher Tim. I’d love to come back. ‘This was a birthday present from my family and I was really nervous about painting outdoors. What a fantastic experience, beautiful scenery, lovely people who made me feel as if I could achieve something special.’ Anne Young, Swansea. ‘Thankyou for a wonderful few days I can’t believe I’ve produced such a wonderful piece of art, I could not have done it without your expert tuition and guidance. It was a pleasure to meet you both and I will definetly be coming back.’ Wendy Child. ‘it has been a fantastic four days learning so much....Tim is a wonderful teacher and I hope to be back next year. ‘ Brenda Levell, Cheadle. ‘Thanks so much once again- you are still the best teacher in the world! ‘it was inspiring and invigorating being with you, exploring a new side and for me particularly painting in Cornwall, meeting you both was the best thing.....what talent!’ Daphne Stevenson, London. ‘Thanks Tim, I’ve enjoyed every minute. Your tuition is excellent and I would love to come back for some more.’ Richard Winward, Cheshire. ‘WOW! I have learned so much...thanks Tim you are an inspirational teacher...great memories..I shall definitely be down again.’ Sue Watson, Lindfield. ‘A wonderful few days, I have learned so much, thank you- I will now just go for it! ‘Thanks Tim and Hen! a Privilege to work here and see you both in action. It was an excellent start for me...a lovely place and an exciting part of the world. ‘We have learned more than ever before....You have been a great teacher, the best we have ever had! ‘I have really enjoyed these two days, thank you so much.’ Bruce, Hampshire. “Than you for making our trip so enjoyable and for your patient teaching....Tim you are an excellent teacher.” Sabeena Khattack, Great Yarmouth. Anne Lagasse, Bowen Island Canada. Thank you again.” Jain Garrad, Essex. “Thanks so much for a wonderful couple of days- you have inspired me to keep up my attempts at painting. I really have learned so much.” Louise Tipping, Cuddington. “Had a great time, learned a lot...great tips which will help my development i.e. colour mixing, tones, perspective and composition. Thank you!” Anne McCrossan, Ireland. “In three days Tim has taught me alot more than I ever knew before and alot more than I ever could have expected.” Norman, Oxon. 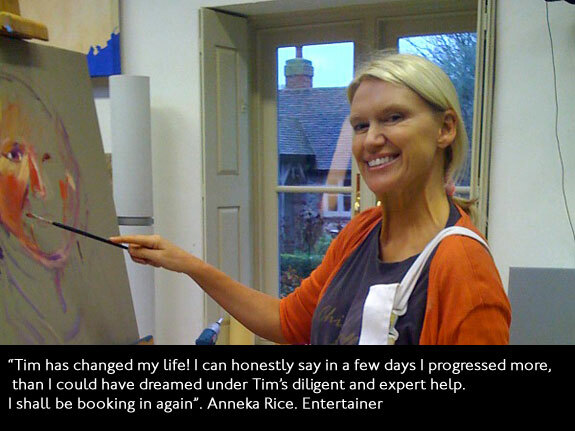 “Tim is simply the best teacher in the world.” Anna, Oxon. “What a wonderful week. After 6 hours on the train I was welcomed by warm and friendly people who made me feel at home. Tim is amazing....Tim has so much knowledge and is so patient..I would recommend this course to anyone, not only for the excellent tuition but also the accommodation and surrounding. Thank you for everything.” Kath Brett. Hayling Island. 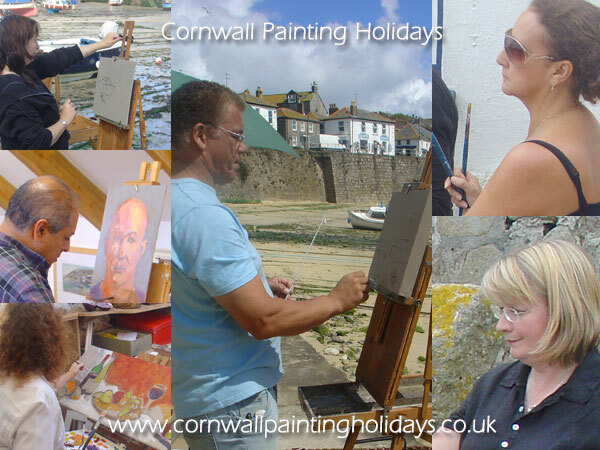 “Thank you for a really wonderful painting holiday, Tim has been so helpful with his tuition and very encouraging…. we will be coming again no doubt with our followers” Joyce Hipson, Falmouth.